When Sean Ong’s putt rattled the back of the cup on the 19th hole to win Kingswood’s fifth order encounter with Waverley’s, Luke Marino, a sigh of relief came over the Kingswood camp. 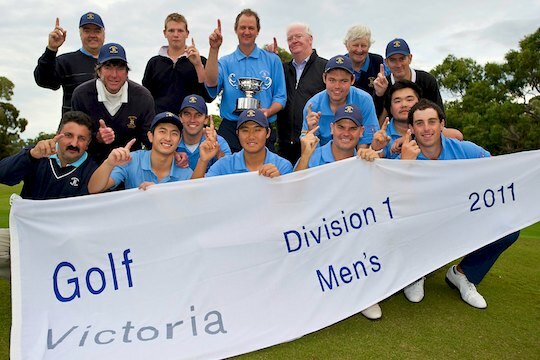 Their team had turned around events of twelve months earlier and won the prized Golf Victoria Division 1 Men’s Pennant Flag with a 4&3 victory over defending champions Waverley at the Cranbourne Golf Club. It was a final that could so easily have gone to either team. The first signs of a pending Kingswood victory came from Kingswood’s number four, Gunn Yang, with a solid 5&3 win over Kevin Smith. Earlier, Chris Hanrahan was the first to place a victory with the Waverley Captain securing the seventh match with a 5&3 win over Tim Burton. Despite the first strike going to the defending champions, it was the outcome in the middle order matches where the flag eventually fell into Kingswood’s hands. “Where we were able to get this final across the line was in the middle order,” remarked Kingswood’s team manager, Robert Strain. Ash Blake secured a pivotal match playing number six against Michael Rice winning on the 19th. Blake, playing off a plus-2 handicap from Shepperton, headed into Cranbourne’s 16th with three-up and three to play margin and victory appeared certain. In similar fashion to his late charge against Blake McGrory in last year’s final, Rice refused to give in and won the next three holes to force the match down the 19th. A wayward tee shot from Rice resulted in a difficult approach into the green but a majestic wedge shot to within three feet of the pin rejuvenated the Waverley camp. Unfortunately for Waverley, Rice missed his putt and Blake secured the vital win for Kingswood. The win would prove invaluable as the next match, the fifth order encounter between Sean Ong and Luke Marino had also progressed to the 19th. “All the players have contributed in some way this season to this win,” said Strain. If there were to be any standout performances identified during the final, it would be hard not to recognise the stellar efforts of Sean Ong and Gunn Yang from Kingswood. Ong’s fifth order match against Luke Marino was the second of the two matches to progress down the 19th and he knew the outcome of his match would determined the final as Waverley’s top order of David Coupland and Brett Drewitt were sitting pretty with their matches. Upon hitting arguably one of the shots of the final, with a seven iron to four feet of the pin, the champagne corks were starting to be popped by Kingswood as they already had three wins in after their number three, James Zappelli won his encounter 3&2 over Brady Watt. Following Ong’s shot into the 19th, Kingswood’s supporters rushed to congratulate Ong and urge him onto victory. Ong knew he’d played a match winner shot but kept his composure while the Kingswood camp started rejoicing at the prospect of victory. “Ong played fantastic golf out there for the team today,” remarked Strain. Waverley’s remaining two matches were secured by their top order with Brett Drewitt winning his match against Terry Vogel, 2&1, to remain undefeated in the series. Drewitt is a class match player and will now prepare for his overseas commitments beginning next month in Scotland with the St Andrews Links Trophy. England’s David Coupland, playing number one for Waverley, also won his encounter with a 3&2 win over Anthony Houston. Kingswood last won the Division 1 flag in 2006. A committed period of talent development with a strong youth program has brought benefits to one of the longest established sand belt clubs in Melbourne. “A lot of effort has been put into this by many club members,” says Strain.